2000 Watt maximum capacity heavy-duty continuous use transformer. Converts single phase 220/240 Volts down to 110/120 Volts. Compatible with 50Hz/60Hz. Hard wired with a European Shucko plug also good for Asian outlets. Durable design with a heavy-duty cord. Built-in fuse protection - Comes with 2 extra fuses. 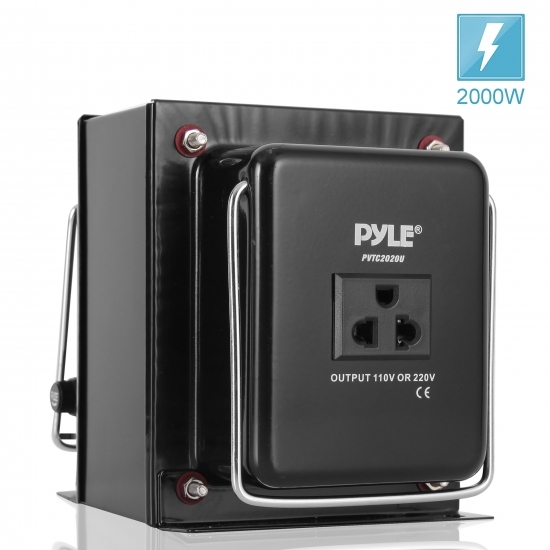 2000 Watt maximum capacity heavy-duty continuous use transformer Converts single phase 220/240 Volts down to 110/120 volts. This unit is compatible with both 50Hz and 60Hz. The grounded outlet in the front of the unit accepts 3 or 2 prong US and Euro/Asian plugs. The insulated power cord is hard wired with a European Shucko plug, also good for Asian outlets. Heavy-duty metal casing and durable design make it easy to travel with and carry. Its fuse protection will cut off the current if the transformer is overloaded to protect the transformer and your appliances. This unit is CE Approved and Certified as well.